Alonso is scheduled to log his first test laps with Andretti Autosport in preparation for competing in the 101st Indianapolis 500 on Wednesday, May 3, at Indianapolis Motor Speedway. Alonso, the Formula One World Driving Champion in 2005 and 2006, will lap the 2.5-mile IMS oval between 9 a.m. to 5 p.m. in his oval-track debut. On Sunday, Alonso will meet-and-greet his Andretti Autosport teammates and American media during a news conference at noon (EDT) at Barber Motorsports Park in Birmingham, Ala. The 2.3-mile/17-turn natural-terrain road-course is the site of this weekend’s Honda Indy Grand Prix of Alabama presented by America’s First, third race on the 2017 schedule. Joining Alonso during the news conference will be Zak Brown, executive director of McLaren Technology Group, parent company of the McLaren Formula One team for which Alonso drives; Michael Andretti, CEO of the Andretti Autosport team fielding Alonso’s Indianapolis 500 entry and Mark Miles, CEO of Hulman & Company, parent of INDYCAR and Indianapolis Motor Speedway. Alonso stunned the motorsports world last week when he announced he would skip the Monaco Grand Prix _ F1’s most prestigious event _ on May 28 to compete in the 101st Indianapolis 500 presented by PennGrade Motor Oil at IMS. The Spaniard will make his IndyCar Series debut in a Dallara/Honda entered by McLaren and prepared by reigning race champions Andretti Autosport. Alonso drives for McLaren Honda in the FIA Formula One World Championship. Alonso, 35, is aiming to win the second leg of auto racing’s Triple Crown. A winner at Monaco in 2006 and 2007, Alonso is bidding to add victories in the Indy 500 and sports car racing’s 24 Hours of Le Mans to his impressive resume. Alonso never has driven a Dallara Indy car chassis powered by a turbocharged Honda Hl17TT Indy V6, much less compete on an oval. 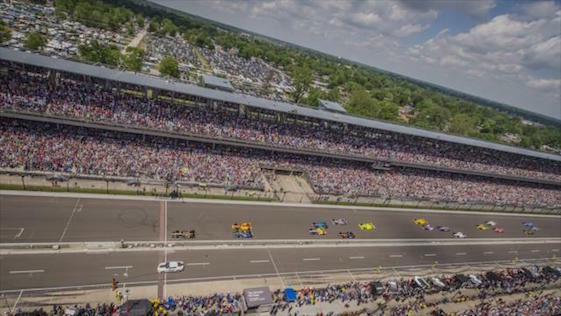 At IMS, Alonso will be challenged by a 2.5-mile oval ringed by concrete walls protected by SAFER Barrier technology, sustained race day speeds in excess of 225 mph and as many as seven pit stops. “(The Indy 500) is one of the best races in the world, one of the most prestigious races in the world,” said Alonso, outlining his decision. “As a driver, if you want to be the best, if you want to be considered the best, you need to be able to drive all type of cars in all different series and be able to be competitive in all of them, and if possible to win all of them. Alonso’s four Andretti teammates include reigning Indy 500 champion Alexander Rossi of California, an aspiring F1 driver who won the 100th Indy 500 as a rookie in circumstances similar to those facing Alonso. Andretti Autosport’s Ryan Hunter-Reay won “The Greatest Spectacle in Racing” in 2014. Fans can watch the entire Alonso test free of charge from the Turn 2 viewing mounds, IMS Museum parking lot and South Terrace Grandstand. Ed Carpenter Racing has entered Zach Veach in place of the injured JR Hildebrand at Barber Motorsports Park this weekend. Veach will make his Verizon IndyCar Series debut in the No. 21 Fuzzy’s Ultra Premium Vodka Chevrolet while Hildebrand rests his left hand. Hildebrand broke a bone in the hand on Sunday, April 9, in a final-lap incident during the Toyota Grand Prix of Long Beach. The break required surgery, performed on Tuesday, April 11, at the Indiana Hand to Shoulder Center in Indianapolis. Veach, 22, has six Indy Lights wins, including three last season on his way to a third-place finish in the championship. The Stockdale, Ohio, native already has been confirmed to drive in this year’s Indianapolis 500 with A.J. Foyt Racing. Veach will be joined by teammate Spencer Pigot, road and street-course driver of the No. 20 Fuzzy’s Ultra Premium Vodka Chevrolet. Pigot, of Orlando, Fla., is the 2015 Indy Lights champion and winningest driver in the Mazda Road to Indy driver development program. NBC Sports Network will air qualifying at 4:30 p.m. (EDT) on Saturday. The live broadcast of the 90-lap race begins on NBCSN at 3 p.m. (EDT) on Sunday.